1 x Regency Hi-Lo highchair with seat insert. 1 x Cozi-Sleeper Multi-functional bed side crib. The Horizon Go is designed for outdoor lifestyles with its robust multi-terrain tyres and 4-way suspension. It also features contemporary Oxford woven marl fabrics on a beautiful textured matt Aluminium chassis. Horizon Go features a unique and compact “clamshell” fold, making it easy to store. For added ease-of-use, it folds with the seat unit in place, both in forward-facing or parent-facing mode. 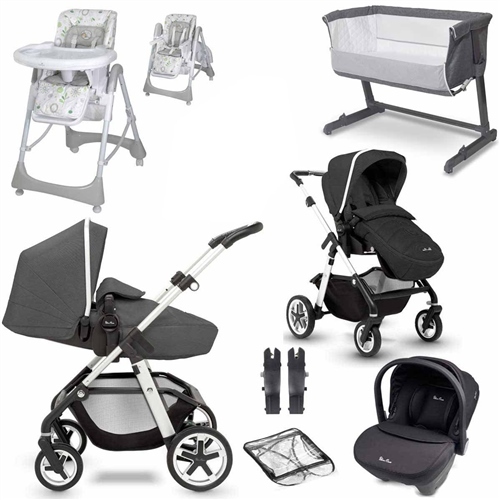 The forward and parent-facing seat unit features a removable babynest for newborns so there’s no need for a carrycot. The babynest creates a cosy, lie-flat pramette for newborns. For added comfort, it’s made from the softest natural bamboo fabric that’s antibacterial and helps to regulate temperature. As your little one grows, the babynest can be removed, leaving a reversible pushchair seat that’s suitable up to 25kg. Horizon Go is available in fashionable colours, using luxurious Oxford woven marl fabrics. Each of the colourways is complemented by a lightly textured matte silver aluminium chassis. The natural bamboo babynest creates a cosy lie-flat pramette for newborns so there’s no need for a carrycot. The natural bamboo helps regulate temperature and has anti-bacterial qualities. Designed for practicality, the unique clamshell design creates a neat, compact fold with the compact chassis. The Horizon Go has 4-way dynamic suspension, lockable swivel wheels and large, robust multi-terrain tyres. Perfect for active, outdoor lifestyles. Premium, Oxford-woven marl fabrics on a beautiful textured matt aluminium chassis. Extendable UPF50+ hood is perfect for sunny days, with a pop-out sun peak and ventilation panels, plus a useful viewing window. This stylish and practical Regency Highchair is designed with baby’s comfort in mind with the padded seat, three reclining seat positions and padded leg rest. Safely secured with a 5-point safety harness you can remove the padded inner lining to adapt to your child’s needs as they grow. This clever design offers an ideal highchair during feeding times with a 5-position adjustable seat height allowing your little-one to join you at your dinner table. Suitable from 6 months this is the ideal highchair for weaning and eating alongside the rest of the family. The Regency highchair includes a 3-position reclining seat. As it has 5 height positions it can fit easily at most tables. Easy to clean the wipe-able tray features handy cup holders and you can store all your essentials in the storage basket.